Walking around with thumbs hooked in my front belt loops makes it difficult to fire off shots. Camera shots of course. Spending a good deal of time with nose to pistol case windows, my mind plays out a fantasy of swishing down the dirt streets with a long, black duster one side tucked to reveal a fancy hand-tooled holster and matching silver plated, ivory handled Colts. It would be difficult however to win a gun fight with my black hat tipped this low over my eyes. The same tender spot on my forehead would likely result from tipping the hat back and forth, similar to the stocking hat incident in the Badlands. Not cool. Burned to the ground in 1879, Deadwood was rebuilt on the burned out remains. The original town sits about 10 feet lower than street entrance today. Resistance to the Wild West aura of Deadwood, South Dakota is futile my friend. You will be sucked in. And glad for it. Designated a National Historic Landmark in 1961, in the 1870’s lawlessness defined Deadwood. Illegally settled on Native American Land as a result of Custer’s discovery of gold in the Black Hills, gambling, prostitution, gunfights, and general mayhem was the order of the day. Which is juicy enough, but the town gained its current fame upon the murder of James Butler Hickok, aka Wild Bill in 1876. The Historic Adams House was built in 1892 by Deadwood pioneers Harris and Anna Franklin. Local contemporary press described the home as "the grandest house west of the Mississippi." Today the house operates as a museum devoted to the history and culture of the Deadwood area. While in several notable gunfights, Wild Bill was NOT an outlaw, although his penchant for gambling overlapped nicely with his law enforcement duties. [You know that deserves a chuckle.] Wild Bill had many callings: abolitionist, facilitator of the Underground Railroad Movement, lawman (serving as a US Marshal at Ft. Riley, Kansas for a short period, sheriff of Hays, Kansas and marshal of Abilene, Kansas), gambler, veteran of the Union Army in the American Civil War, and scout. Holding the infamous “dead man’s hand” of two Ace’s and two 8’s, (the 5th and last card having been undealt), he was gunned down from behind by Jack McCall during a poker match. Wild Bill was 39. McCall hanged on March 1, 1877 for the murder. Wild Bill’s life began in Illinois. He traveled from there to Kansas, Nebraska, Missouri, Indian Territory (Oklahoma), New York, Wyoming, and South Dakota. An interview published by Harper’s New Monthly Magazine in 1865, another by Henry Morgan Stanley a Welsh journalist and famed African explorer in 1867, and later being cast as the hero of the earliest dime store novels, resulted in Wild Bill becoming one of the first international celebrities. For someone aged 39 at a time when most travel was at 3-7 miles per hour, his life covered a whole lot of ground. Several locations claim to be THE spot where Wild Bill was shot. I chose this one well, because it made a great pic! Wild Bill Hickok? Buffalo Bill Cody? Calamity Jane? Wyatt Earp? Did they know each other? What were the connections? What was the timeline on these American West Icons? Let’s start with Calamity Jane – there’s got to be a woman mixed up in all this, right?! Martha Jane Cannary, aka Calamity Jane, a frontierswoman and scout became friends with Wild Bill Hickok in Deadwood, South Dakota. While Calamity Jane purportedly claimed they married and Wild Bill fathered a child, these claims have never been proven. Most historical accounts indicate Jane was indeed infatuated with Wild Bill but the romantic liaison was fabricated. Calamity Jane later became a horse rider and trick shooter in 1893 for Buffalo Bill Cody’s Wild West Show. She died in 1903. Her dying wish was to be buried next to Wild Bill Hickok. She now lies interred beside him in Mt. Moriah Cemetery, Deadwood, South Dakota. Wild Bill Hickok met Buffalo Bill Cody (purveyor of the Wild West Show that gained international fame in the late 1800’s) during their short but common stint with General Jim Lane’s vigilante Free State Army (“The Red Legs”) in 1855. Buffalo Bill was only 12 years of age, scouting (reconnaissance) for the General. Wild Bill was 21. They became life-long friends, their paths crossing many times before Wild Bill’s demise in 1876. Wild Bill played a part in Buffalo Bill’s show “Scouts of the Plains” along with Texas Jack in 1873. They left the show circuit well before the famed “Wild West Show” began. Wild Bill Hickok, Texas Jack, and Buffalo Bill Cody. 1873. To put all their ages in perspective, Wild Bill Hickok was the oldest being born in 1837. Buffalo Bill Cody and Wyatt Earp were 9 years younger than Wild Bill with birth dates in 1848. Calamity Jane, born in 1852 was 15 years younger than Wild Bill. Mt. Moriah Cemetery. Deadwood, South Dakota. Final resting place for Wild Bill Hickok and Calamity Jane. This shot was literally “captured”. Fortunately, I wasn’t. Breakin’ the law. 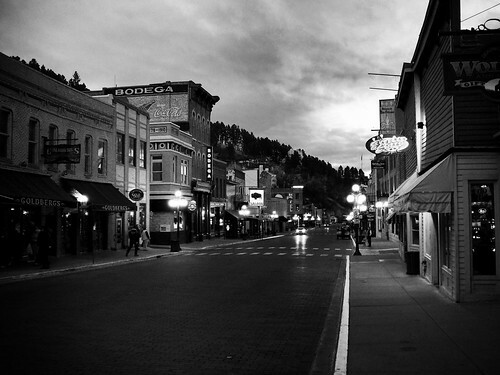 Today Deadwood is a mecca for gambling with every false storefront tucking away a casino. If you’re a gambler, then any time of year works. If you’re not (I’m not), I’d recommend October. This last visit was only weeks ago in March and while it was off-season as far as crowds go, it was also cold enough to keep most people inside. And that’s NOT where you want to be. October was divine. I had Main Street to myself. Sitting on a bench one evening, the stars bright overhead, gazing down the lamp lit street, I was transported to another place and time. I went to bed viewing the scene above from my hotel room window. The black duster thrown over the back of an imaginary chair, the matching Colts on an imaginary table, I slept with a smile on my face. It’s always helpful to read articles from other writers and use a little something from other web sites. Very nice history. I have a coffee shop called Aces & Eights after uncle Bill’s deadmans hand and I love reading other people who get into the history of it all. I just had to leave a comment again. Very evocative writing. I like that 1st paragraph especially. I came back just to read it! I believe that it’s very important to remember and respect a certain area’s past while you visit. You seem to travel with such a perfect balance-curious about the past, yet completely enraptured with the present. Will keep that in mind for my future adventures!! Love the Badlands and South Dakota. Have never explored Deadwood. That can be remedied – great history and fun! I have a can of Bag Balm up in the cabinet just for her…..REALLY! Oh crap, got to run. The IRS needs my check…….. REALLY! You know – I feel that wearing a poncho here, might just fit. A fun way to learn history! Always enjoy your stories and pictures. I know where you can find a fine sculpture of Buffalo Bill!!! Hat pulled low…. black duster…staring at a fine pair of six-shooters….a sight to imagine. I’ve learned more about the icons of the West in this post than I have in a lifetime of dime novels. A dab of Bag Balm will soothe that sore spot where the hat rubs. Tell me more! I’m headed to Deadwood. My horse and I should make it by Summer.